Hindu Mantras for healing and wellness. Mantra Chanting is an age old technique used for spiritual healing, and empowerment. Śani is one of the Navagraha or Jyotiṣa (the nine primary celestial beings in Hindu astrology). Shani is embodied in the planet Saturn and is the Lord of Saturday. 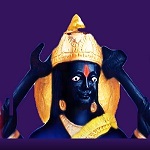 Shani is also known as Śanaiścara (शनैश्चर).